Yesterday I attended the last of the Kongō monthly series of the year. As usual two Noh plays were performed, but I was particularly interested in seeing the Iemoto Kongō Hisanori perform Genzai shichimen, a play that has been staged yesterday for the first time in 60 years. The play is currently in the repertorie of the Kanze and Kongō schools only, and its special feature is a costume change and mask ‘change’ on stage (not seven masks, just one – in case you are wondering…) in second half. In this play two masks are donned one on top of the other. Rebecca Teele Ogamo regularly writes extensive programme notes with detailed costume and mask information every month – thanks to Rebecca’s notes of Genzai shichimen I was able to appreciate the play even more. I did go through the utai of the play with Udaka Michishige-sensei, who was jigashira chorus leader, a couple of times, but the kyūhon ‘old’ cursive utai-bon script made it difficult to follow the story, so I am grateful to Rebecca for that! In the play the waki, Nichiren Shōnin (1222-82), founder of the Nichiren sect of Buddhism, is preaching at Mt. Minobu (Yamanashi prefecture). A local woman rejoices in hearing the Lotus Sutra preached, and. upon Nichiren’s questioning, she replies that she suffers the Three Burning Torments. Eventually, she reveals her true nature: she is the Dragon who lives in the Shichimen Pond. At this point thunders and lightings fill the sky and the woman disappears. In the second half of the play, a Dragon enters, with a particular costume and mask set up. Though Kanze uses a Hannya mask, the Iemoto chose a terrifying dai-ja (great serpent) mask, of the kind used for the Noh Dōjōji. This mask in the Kongō collection is rather scary due to its asymmetry and grotesque, contorted fanged mouth. 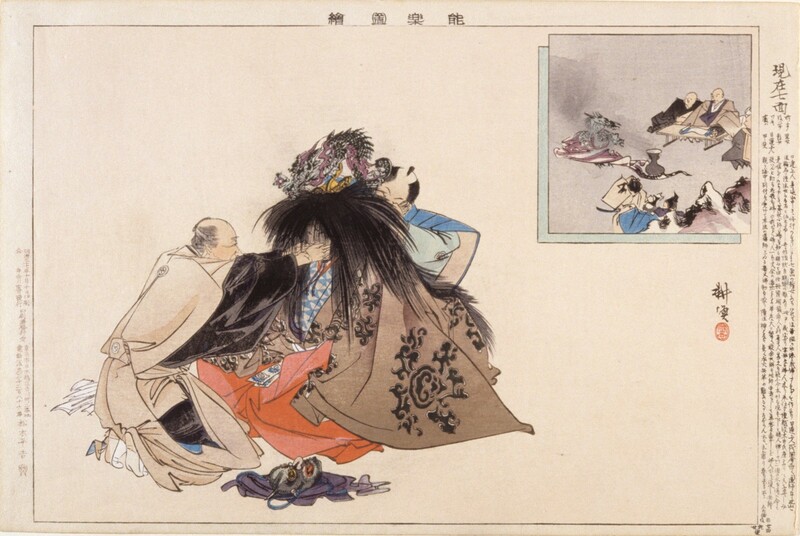 However, after Nichiren has recited lines from the Lotus Sutra, the Dragon goes retreats to the back of the stage, where assistants help to change costume and mask. Besides Dai-e, where the shite wears the shaka Buddha mask on top of a beshimi tengu mask, Genzai shichimen is the only other play I know were two masks are worn one on top of the other. I can only imagine how difficult it is to move on stage with such set-up. The Dragon transforms into a heavenly maiden (zo-onna was the mask used yesterday) who then dances a kagura Shinto Dance in thanks for having reached enlightenment, and finally flies away in the clouds. Nichiren was a militant preacher, advocating the primacy of the Lotus Sutra above all other Buddhist doctrines. His aggressive attitude towards the other Sects, which he deemed responsible for the corruption of the country during his time, was extreme. He founded the first Buddhist doctrine originating in Japan, and could be seen as an precursor of Japanese religious nationalism (though this is usually associated with Shinto). The combination of Buddhist and Shinto elements can be found in other plays, but it is even more justified in this play since Nichiren (as others before him) comprised Shinto elements, such as the Sun-Goddess Amaterasu, within the all-encompassing cosmos of the Lotus Sutra. The author of the play is unknown, but I wonder whether the various special features – a dragon god/heavenly maiden, an important waki character, special effects such as costume and mask change) – don’t indicate that the play was probably written in the late Muromachi Period. Yamanaka Reiko and Lim Beng Choo have written about plays composed during this period here and here.